Artiss YouTube Embed: The YouTube ID of nDihvJfL9qo is invalid. 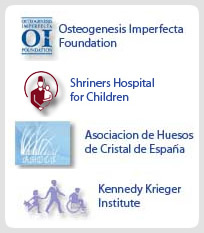 The treatment of osteogenesis imperfecta in Panama is centralized in the capital, Panama City. Dr Jorge Mejia leads the team of specialists working with OI patients in the Children's Hospital and has made tremendous strides in educating other physicians and patients across the country about the OI. A couple of years, OI was unknown in Panama. Not that there was, just that unless you suffer, did not know existed. Today, thanks to the efforts of the Crystal Children Foundation, and with the help of Dr. Mejia and Dr. Renan Arauz, and there is more knowledge about children with OI. "I met many people far away in the mountains,"Says Arauz. "They could not receive any help and assumed it was normal to live with OI was. That's why I decided to help them in their situation. " "We set the type of OI have that kind of treatment should be,"Says Dr Mejia. "According to the number of fractures that the patient has had, they try and avoid the most deformities. " Parents of children with OI are taught and put casts just before taking them to hospital to avoid the most deformities. A bone taken from a month to three months to heal in a cast, and once the cast is removed, to do physical therapy. Depending on the strength of the patient's bones, You can also do preventive physical therapy. "They come to therapy from babies,"Said Anabelle Fernandez, Children's Hospital physiotherapist. "We encourage parents of exercises that can do at home. Often live far, and can not come this far, if we teach the parents some years. " Because the number of fractures suffered by a child with OI, sometimes you can not do physical therapy. To make effective physical therapy, OI patients need a drug called pamidronate, that is not available in Panama. Without this drug, a child with OI is in a high risk of fracture, but receive therapy. "The medicine helps with two things,"Said Mejia. "It helps reduce the number of fractures that can happen to a child and ease the pain of fractures. Also, helps to increase bone mass, without eliminating the genetic defect that the patient has. " The medicine does not exist in Panama, despite the efforts of Dr. Mejia, Dr. Arauz, and Dayana Castillo, director of the foundation. The group is organizing a protocol for the medicine to be approved in Panama, and Angie Nunez, Dayana's daughter, is the perfect example of how the medicine works. "The first thing to do is submit the protocol for the medicine to be used here,"Said Mejia. "That is where we are now. You have to go through different offices, and will take a while. We have taken initial step and. Hospital officials are in total agreement with us to begin treatment here. " The drug is administered intravenously every three months, and the patient must be admitted to the hospital 24 hours. Dayana and her husband Alvin Angie carry the Dominican Republic every three months for treatment. "Everything needs to be a cycle,"Says Mejia. "We need medicine to complete the cycle, because without medicine, the rest of the treatment does not work. " Part of the problem that the medicine is used in Panama, the health record. The foundation has achieved international drug donations can not be used because they have this certificate to be used in Panama. "If the company does not show any interest in renewing the health record, there is nothing we can do,"Explains Lucas Mora, director of the Ministry of Health. "Neither we nor the foundation can record the medication without the company that makes, and to use, the drug requires registration. " Mejia, Arauz, Dayana, and the foundation continue to fight for the drug in what has been a long and arduous battle with the government. "Pharmaceutical companies of the country are not interested in this medication because the population is very small OI,"Explains Mora. "It is not profitable for companies, since there are less than 60 cases in Panama. These companies believe in profits, and not bring that medicine is profitable due to few cases. " Dayana's frustration arises in part because the dilemma of bringing medicine to Panama is the cost, and the difference they can make in the lives of these children with OI. Receive this medication is the right of these children, and they are violating the right to get help. And so, the fight continues. "We must take steps,"Said Mejia. “Primero, we have to make the recipe for medicine, you already know how to do. After, want to create an international support network to compare protocols and study how the IB here in Panama and other countries. "Once these phases are ready, the document must be presented to the Ethics Committee of the Children's Hospital. Once they approve it, passed to the National Ethics Committee. When there already is approved, the direction of the Ministry of Health approves and is responsible for providing medication to the Hospital. " Once the protocol is legalized, as Dr. Mejia hopes will be a period of six months, it will require an increase in infrastructure and personnel. "The problem is not just medicine,"Says Mejia. “Sino, entire infrastructure: need space, food for the patient, beds, nurses, and other doctors caring for the patient by 24 you have to spend hours in the hospital. This process has to go every three months. " Train other doctors is also vital for the future treatment of OI in Panama. There are certain types of surgery are important to teach doctors to reduce the rate of fractures suffered by a patient. "We need to train doctors in surgical,"Said Mejia. "We look for places where these operations have been conducted to train the Panamanian doctors to put a pin intramedullary." Mejia and his team have the right equipment to perform these surgeries, but plan for the future and thus seek to perform surgeries in Panama. It is not an easy road ahead of them all supporters of this cause, But the situation looks better than existed before the Foundation. "This problem has been a lifetime in Panama,"Says Dr. Arauz. "Only it was not until right now that people began to cooperate and pay attention. We need more people to take initiative and accept that we have a problem. "This in the hands of the foundation and the medical community to educate people because we exist as a foundation and what is our purpose. If a child a year suffer a fracture because he was changing a diaper, there is something wrong. It's really important that people understand that something is happening and we all have to do something about it. "